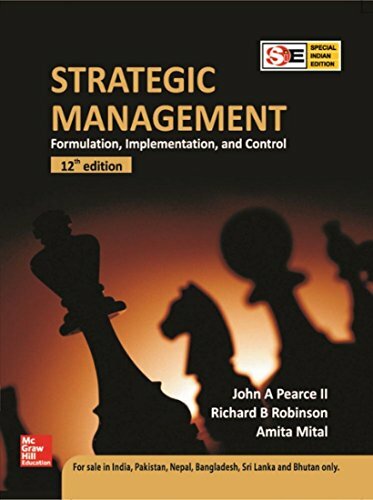 BBA|mantra`s Strategic management Notes/E-book will serve as a concise textbook for BBA/BBM/BMS/MBA and other management students and will provide a brief knowledge on various concepts of Strategic management. This ebook includes a concise presentation of the subject matter with the extensive use of charts, tables, and figures to help students understand the core concepts of Strategic management. These Strategic management notes are based on the latest syllabus of popular management colleges in India. Strategy comes from a Greek word “strategos” which means generalship i.e. art of the general. A plan or course of action or a set of decisions making a pattern or creating a common thread. A pattern or a common thread derived from the policies goals and objectives of an organization. The activities that move an organization from its current state to desired future state. The resources necessary for implementing a plan or following a course of action. Strategic management refers to a set of managerial decisions and actions that determine the long-term performance of a corporation. It includes environmental scanning, strategy formulation, strategy implementation, evaluation, and control. The notes is interesting and engaging. Very systematically built. Will definitely help preparing for the exams.